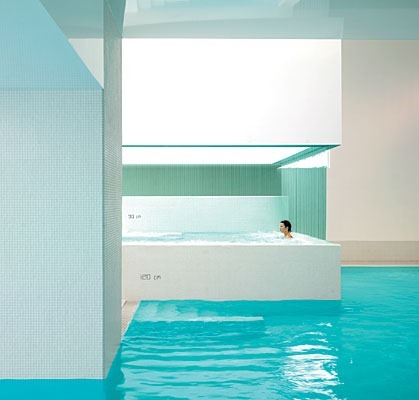 The $29 million Les Bains des Docks aquatic center, reimagines the concept of a public pool. 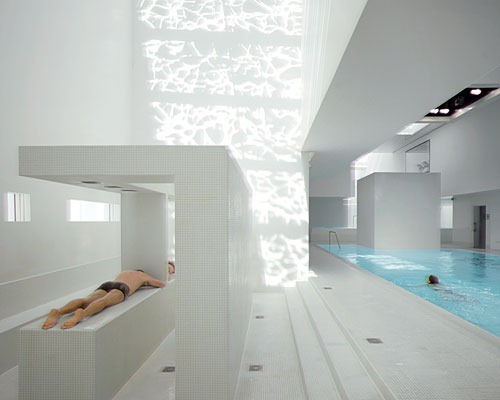 The overall design was inspired by the Roman thermal baths as people can go to congregate in most of the various pools year round. 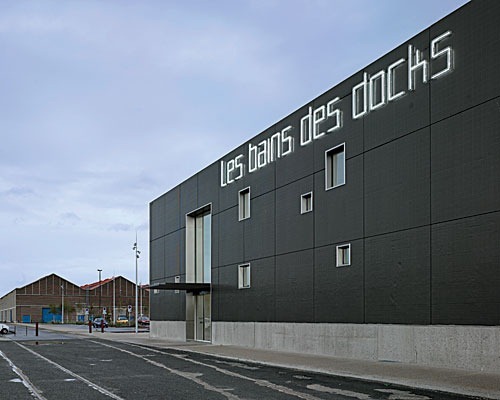 Located in Le Havre, France, it is the brain child of designer Jean Nouvel. On the exterior, the boxy precast-concrete shell, painted gun-metal gray, echoes the scale and simple massing of surrounding warehouses. Only the playful composition of rectangular apertures hints at an interior transcending the ordinary or functional. Inside the front door and up a run of blanched terrazzo steps, the pure white interior—animated by daylight, water, and a quasi-Cubist composition of blocky three-dimensional forms—begins to reveal itself, and the effect is dazzling. The luminously translucent pâte de verre squares establish spatial continuity and a module for the 92,570-square-foot building: No tile was cut. Inside, following the Roman model, a dozen different options exist: hot and cold baths, whirlpools, saunas, a Turkish bath, fountains, sprays, soothing “rain,” turbulent jets, and pools spilling into one another. In the area for children and families, a hidden, tortuous slide offers an exhilarating plunge, while nearby, a veil of water surrounds a pool, and fine geysers shoot up from a floor. 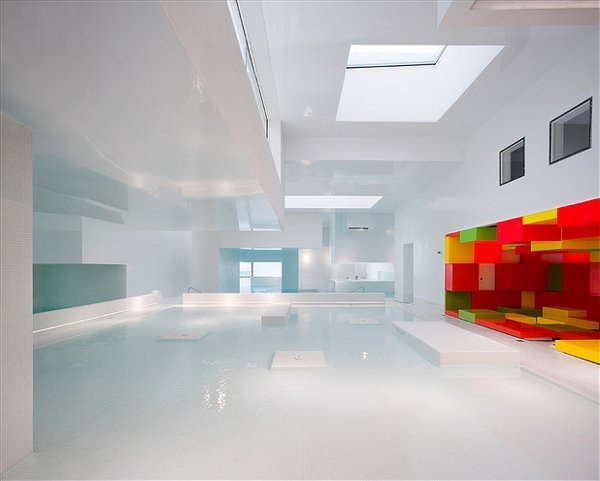 Here, the only splashes of color appear: wall, ceiling, and floor cushions resembling giant Starburst chews. Nouvel’s team carefully limited reverberation. Glossy, stretched-fabric ceilings of varying heights mute noise, as does the blocky geometry, articulating intimately scaled areas. Mostly you hear sounds of water: trickling, gushing, roaring, trilling, or lapping. 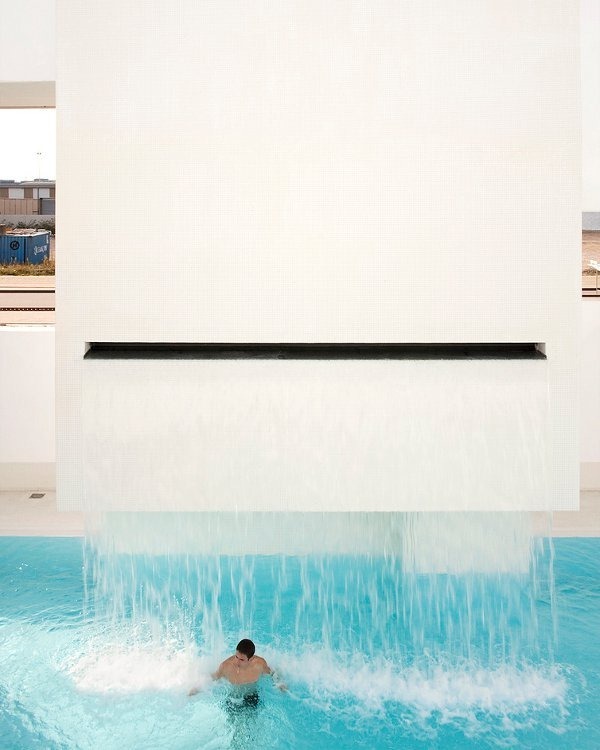 Les Bains appeals simultaneously to the senses of sound, touch, and sight. Shafts of sunlight filter in, flicker off the water and shiny ceilings, and refract through the translucent tiles. (Nighttime illumination subtly glows from underwater or semi-hidden sources overhead.) Sight lines and apertures offer oblique views between pools, to the sky, or out to the dock and harbor. In this sanctum of serenity, you never lose touch with the outside world. Les Bains Des Docks is not an exclusive resort, it is open to the public. Entry costs 5 euros per person before group, youth or senior discounts.